Bug: paranoia, terror, and redemption. 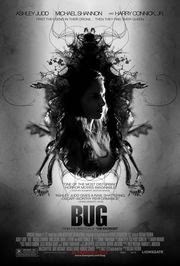 I've been ignoring Bug for years - which is silly because it's directed by William Friedkin (best known for directing The French Connection and The Exorcist in the 70's). Perhaps it's the cover: It looks like some super-low budget, "independent movie" about some kind of giant cockroach infestation. (Like that segment in Creepshow, "They're creeping up on you!" where the germ-o-phobic old man's apartment is flooded with bugs - classic!) Now, I'm not scared of bugs, per se, but I'm just not excited about bug movies. Side note: Way back in college, I remember reading an article about why humans hate swarms of things (written from a sociology perspective) and why we thus feel frightened by subcultures and minorities. Great article - wish I could remember the details so I could write more about it here. You'll have to rely on your own Google-fu to track down this terrific piece of writing. So recently (and I use "recently" in that typical way that I do which has little or no relation to actual time). I read though Rue Morgue's 200 Alternative Horror Movies You Need To See, and I decided to give Bug a chance. Here's what happened: I didn't immediately fall in love with Ashley Judd but I am always impressed with her range and the ease with which she plays the perfect, stereo-typical-no-class-white-trash-un-educated broad. There's always something so genuine about her, regardless of who she's playing. Michael Shannon, who I can only think of as his character in "Cecil B Demented," actually impressed me, as well. I'm sure people know him now, from larger movies (2013's Man of Steel, for one) but I never really considered him an actor of any note. Dear Michael Shannon, this is me, apologizing to you. Even after reading about the movie, I was still surprised by the nail-biting tension that built through the entire movie. The chemistry between Ashley Judd and Michael Shannon is fantastic; they play their insanity off one another so seamlessly - you could almost imagine that they're both actually nuts (and made for one another). But the end of the movie... the level of insanity achieved within the last few moments was possibly too much for me to appreciate. While paranoia is a great idea to flirt with, Friedkin was a bit heavy-handed, leaning too hard on challenging the idea that they were paranoid, implying that there really was "something bigger" going on. And I think that actually turned me off a bit because the "something bigger" seemed to be "aliens" and boy oh boy am I disinterested in alien movies. (Well - evil, dabbling, abducting, human-farming, aliens). Overall: I'm glad I finally broke down and gave it a chance (Thanks, Rue Morgue) but I won't be running out to buy a copy any time soon.